Australopithecus, "Little Foot" foot bones, (StW 573), Sterkfontein, 1994. Credit: Mike Peel, CC-BY-SA-4.0. After 13 years of meticulous excavation of the nearly complete skeleton of the Australopithecus fossil named Little Foot, South African and French scientists have now convincingly shown that it is probably around 3 million years old. The paper is titled: Stratigraphic analysis of the Sterkfontein StW 573 Australopithecus skeleton and implications for its age, and is the result of a detailed study of the stratigraphy, micro-stratigraphy, and geochemistry around the skeleton. The Sterkfontein caves of Gauteng, South Africa have been world famous since 1936 for producing large numbers of fossils of the ape-man Australopithecus. However, for sixty years, these fossils consisted only of partial skulls and jaws, isolated teeth and fragments of limb bones. These were obtained by blasting or drilling and breaking of the calcified ancient cave infill or by pick and shovel excavation of the softer decalcified infills. Questions arose about the age of these fossils, of how they came to be in the caves, and also of how a complete skeleton would appear. Then in 1997 Ron Clarke, Stephen Motsumi and Nkwane Molefe of the University of the Witwatersrand discovered an almost complete Australopithecus skeleton with skull embedded in hard, calcified sediment in an underground chamber of the caves. They began to carefully excavate this skeleton in order to expose it in place in the cave and to understand the ancient processes that contributed to its burial and preservation. This was the first time that such an excavation of an Australopithecus has taken place in an ancient calcified deposit. During the course of this excavation, it became clear that the skeleton had been subjected to ancient disturbance and breakage through partial collapse into a lower cavity and that calcareous flowstone had subsequently filled voids formed around the displaced bones. Despite this fact being published, some other researchers dated the flowstones and claimed that such dates represent the age of the skeleton. This has created a false impression that the skeleton is much younger than it actually is. A French team of specialists in the study of limestone caves, Laurent Bruxelles, Richard Maire and Richard Ortega, together with Clarke and Dominic Stratford of Wits University, have now, with this research published in the Journal of Human Evolution today, shown that the dated flowstones filled voids formed by ancient erosion and collapse and that the skeleton is therefore older, probably considerably older, than the dated flowstones. 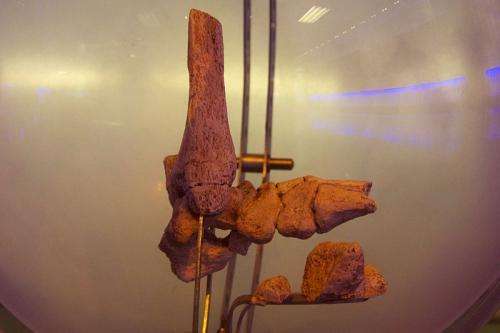 Little Foot is probably around 3 million years old, and not the 2.2 million years that has been wrongly claimed by other researchers. The skeleton has been entirely excavated from the cave and the skull, arms, legs, pelvis and other bones have been largely cleaned of encasing rock. Professor Clarke has concluded from study of the skull that it belongs to Australopithecus prometheus, a species named by Professor Raymond Dart in 1948 on fragmentary ape-man fossils from Makapansgat in what is now Limpopo Province. Thus at Sterkfontein, there existed two species of ape-man, Australopithecus africanus (for example, Mrs Ples) and Australopithecus prometheus, many specimens of which have been identified by Clarke from two deposits at Sterkfontein. More information: BRUXELLES L., CLARKE R. J., MAIRE R., ORTEGA R., et STRATFORD D. – 2014. - Stratigraphic analysis of the Sterkfontein StW 573 Australopithecus skeleton and implications for its age. Journal of Human Evolution.